The Village of Edison historical signs on State Route 95 have been restored and painted by village employees this winter. 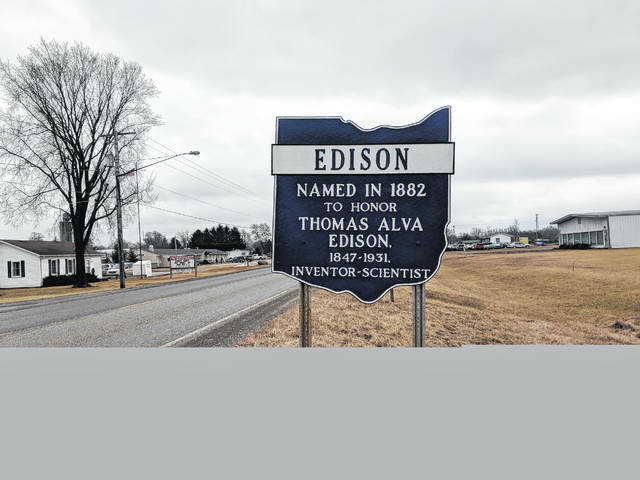 EDISON —Village residents and council members have complained about the deterioration the historical “Edison” signs at both ends of the village for the past couple years. This winter the street department took on the task of painting and repairing both signs. Edison Council member Chris Kneipp thanked Street Manager Rod Clinger and street workers for their great work in repainting and restoring the historical signs on State Route 95, entering the village. Clinger said he and the street staff took down the signs and did the work in the village garage. They cleaned the signs first, then worked on painting over the past couple months. The signs were originally placed at the east and west ends of the village by the Ohio Historical Society and the Ohio Department of Highways. • Another job for village workers has been remodeling the restroom in the municipal building. Clinger said they have made it handicap accessible. Tiles were broken down and plugged at the end of Boundary Street by the old John Deere building. Street workers had to dig it out to repair the tile and pipe. • Council members suggested to Clinger that more salt and grit be put down at intersections in the village both before and after the next snows. Council member, April Anthony said that the crossing by the post office can be the worst since it is on a small hill. Council members asked if there is enough salt and Clinger said there should be plenty to get through the winter. • Council reviewed the permanent appropriations for the village and approved them as submitted by Fiscal Officer, Bruce Seaburn. He noted that there were very few changes. The primary change was the addition of $25,000 for the warning siren for the village. Other increases were for street lights and BPA employee wages. Council member Floyd Wogan asked for help in doing the inventory in the next couple weeks. Mayor Sandy Ackerman and April Anthony said they will help. • Another task that needs to be completed is the approval of council rules. Jeremie West is the head of rules committee and asked council to suspend approval of rules until the next meeting so he and the rest of council have a chance to read them. Ackerman noted that the school debris is nearly completely cleaned up. Crews have been grinding up the concrete before loading it. They are now dumping it at a different location since the first property they used got too soft as the ground thawed and it rained. Several council members mentioned that they appreciated the presence of the Morrow County Sheriff and Ohio Highway Patrol in the village. Officers have been writing speeding and traffic tickets and they said it is good to see them in the village and along SR 95. • The next Edison Village Council meeting will be 7 p.m. Monday, March 12 in the municipal building. https://www.morrowcountysentinel.com/wp-content/uploads/sites/29/2018/02/web1_edison.jpgThe Village of Edison historical signs on State Route 95 have been restored and painted by village employees this winter.